Are you ready to start planning your Smoky Mountain wedding? Imagine having your wedding near the lake, surrounded by over 100 acres of wooded Smoky Mountain views. If you’re looking for a small, romantic ceremony, we know you’ll love our location. Our wedding ceremony area is available to our guests for $150 for 1 hour. 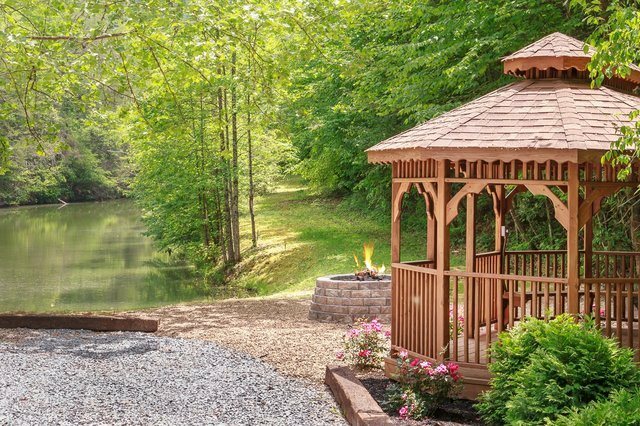 Included in this price is the lakeside gazebo, perfect for the wedding ceremony, gazebo area, gas fire pit and use of the outdoor grill. To learn more about our location for your wedding in the Smoky Mountains, take a look at our FAQ below. How many guests can attend a Smoky Mountain wedding at the Lake Resort? Can we decorate the gazebo area for our wedding? Yes! We do allow you to decorate the area however you choose. We do require that you take down any decorations before you leave. Are any outside vendors allowed? While we don’t allow outside vendors, we do want you to be able to really enjoy your special day. We do allow photographers and videographers for your wedding ceremony. I don’t know anyone in the area who can photograph my wedding. Can you help? Of course! We want to help make your Smoky Mountain wedding ceremony as easy as possible. We can help you with a minister, photographer and cake for additional fees, depending on your individual needs. We aren’t staying at Smoky Mountain Lake Resort, but can we still have our wedding at the gazebo? Currently, we are only offering the wedding location to our guests. We’d love to have you stay with us and celebrate your wedding with us, so be sure to take a look at our Smoky Mountain cabins near the lake for your getaway and honeymoon.